Fans Can Win Round-Trip Flights to Sammy Hagar’s "High Tide Beach Party & Car Show"
Sammy Hagar will be hosting the first annual “High Tide Beach Party & Car Show” in Huntington Beach, California on Saturday, October 6, 2018. A vast collection of luxury, exotic, and muscle cars will also be featured at the event, and if you’re local, you can submit photos of your vehicle to potentially be included in the car show! Guests can also look forward to food, beer, wine, and specialty cocktails. Food options will include selections from Sammy Hagar’s cookbook, “Are We Having Any Fun Yet?” with tastings from his restaurants Cabo Wabo Cantina and Sammy’s Beach Bar & Grill. Fans will have the opportunity to win two round-trip flights to the beach bash, a two-night hotel stay, VIP tickets to the bash, a Limited-Edition Hogue knife, a vehicle battery from Optima Batteries, a set of Center Line wheels, and a $300 K&N gift card. The giveaway starts on Monday, June 25 at 7:00am Pacific Standard Time, and ends on June 28 at 11:59pm. 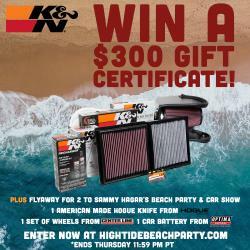 You can enter the giveaway here: www.hightidebeachparty.com/flyaway. Early bird general admission tickets start at $45 and are available online. Reserved seating, VIP packages, and VIP cabanas are also available. Ticket pre-sales begin on June 28, and the public sale begins June 29 at 7am Pacific Standard Time/10am Eastern Standard Time at www.hightidebeachparty.com.